Civil aviation authorities and airlines have grounded more than 40 per cent of the world’s in-service fleet of Boeing 737 Max 8s — the type of jet involved in an Ethiopian Airlines crash that killed 157 people, including 18 Canadians. Sunday’s disaster — following another fatal crash of a 737 Max 8 jet in Indonesia five months ago — has caused alarm in the international aviation industry and wiped billions of dollars off the market value of the world’s biggest plane-maker. On Tuesday afternoon, the European Aviation Safety Agency (EASA) issued a directive grounding all Boeing 737 Max 8 and 9 model aircraft following two recent deadly crashes. The grounding applies to all European Union airspace, plus that of Norway, Switzerland, Iceland, and Liechtenstein. United Arab Emirates, Malaysia, Australia, Singapore and Oman also joined the list of countries that have banned all flights into or out of their countries. 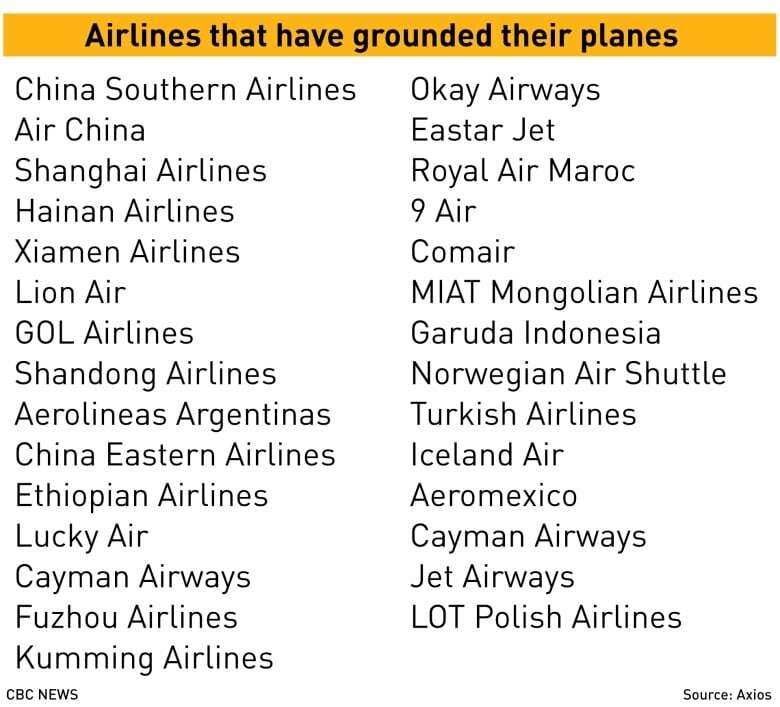 Ethiopian Airlines and all Chinese airlines grounded their Max 8 planes indefinitely immediately after the crash Sunday. Ethiopian has four of the planes remaining in its fleet and was awaiting delivery of 25 more. China has 96 Max 8 jets in service. Indonesia also said Monday it grounded 11 of the aircraft for inspections. India followed on Tuesday, grounding the 737 Max ” till appropriate modifications and safety measures are undertaken to ensure their safe operations,” according to a Ministry of Civil Aviation tweet. Still, Canada and the U.S., said they would keep flying the Max 8. Garneau said Monday it would be “premature” to ground all 41 of the planes currently owned by the country’s air carriers and said he would “without any hesitation” fly on a Max 8. On Tuesday, he again said there were no plans to suspend operation of the Max 8 in Canada, but “all options are on the table.” Canada is working with the U.S. Federal Aviation Authority to determine if action is required. Garneau tweeted later Tuesday that he had cancelled all his meetings and public events on Tuesday to meet with his civil aviation expert panel, and will consider all potential actions. I’ve canceled all my meetings and public events today in order to meet with my Civil Aviation Expert Panel. All evidence is being evaluated in real time and we’re considering all potential actions. The union representing Air Canada flight attendants sent out a statement Tuesday afternoon, saying they don’t want to be forced to fly on the Boeing 737 Max 8. Ethiopian Airlines Flight 302 came down in a field soon after takeoff from Addis Ababa on Sunday, creating a fireball in a crater. It may be weeks or months before all the victims are identified. Black box recorders were found at the Ethiopian crash site on Monday, but it was unclear where they would be examined. As long as the recordings are undamaged, the cause of the crash could be identified quickly, although it typically takes a year to complete an investigation. Given the problems identifying them at the charred disaster site, Ethiopia Airlines said it would take at least five days to start returning the remains to families. “We are Muslim and have to bury our deceased immediately,” Noordin Mohamed, a 27-year-old Kenyan businessman whose brother and mother died, told Reuters. “Losing a brother and mother in the same day and not having their bodies to bury is very painful,” he said in Nairobi, where the plane had been due. Safety experts say it is too early to speculate on what caused Sunday’s crash or whether the two recent accidents are linked. Most accidents are caused by a unique chain of events combining human and technical factors. 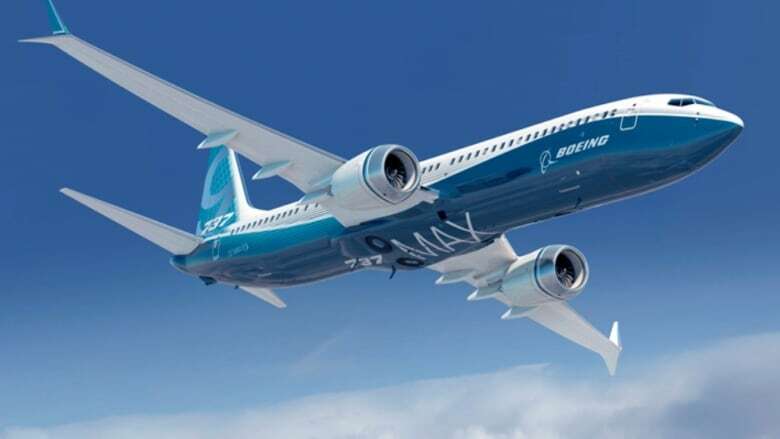 Boeing has said it will deploy a software upgrade to the 737 Max 8. The software upgrade “will be deployed across the 737 Max fleet in the coming weeks,” it said. But the U.S.-based company said it has no reason to pull the aircraft from the skies, and it does not intend to issue new recommendations about the aircraft to customers. Its technical team joined American, Israeli, United Arab Emirates, Kenyan and other aviation experts in the investigation led by Ethiopian authorities. The FAA said it is overseeing some design changes to the aircraft, expected to be in place by April. The FAA also said it expects Boeing will soon complete improvements to an automated anti-stall system suspected of contributing to the deadly crash of another new Boeing 737 Max 8 in Indonesian waters in October, and update training requirements and related flight crew manuals. Shares of Chicago-based Boeing slid almost 10 per cent in early trading on Monday. They ended the day down five per cent, halting a surge that has seen the value of the company’s stock triple in just over three years to a record high of $446 US last week.